Just last week I shared about our family homeschool planning meeting. With high schoolers I feel this is especially important. The Well Planned Day planners play a major role in our writing down of assignments and overall accountability. As homeschool parents of high schoolers we have found ourselves in the guidance counselor role. Not only are we guiding daily assignments and long-term semester projects, we are advising on taking the PSAT, SAT, talking through visiting colleges, planning electives and more! Not only are we recording our weekly homeschool, the books read and all extracurricular activities, we are being prompted to investigate college requirements in a timely manner. 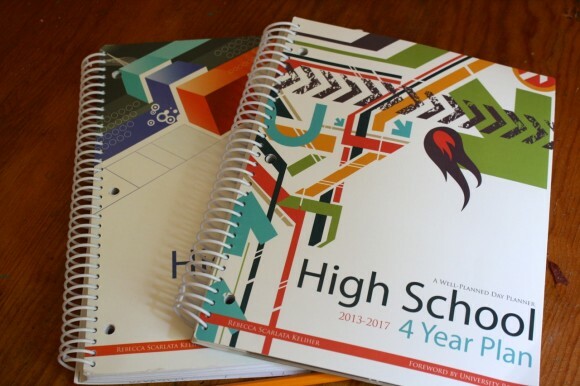 The 4 Year High School Planner is a wonderful help for all that the high school years encompass. 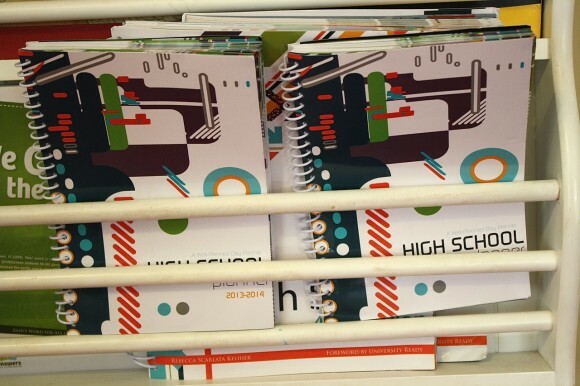 We have a 4 year planner for each of our high schoolers. 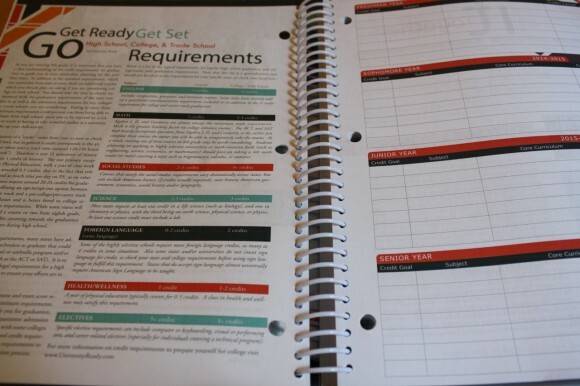 This is the planner we pull out to discuss – and record – credits and long range high school plans. 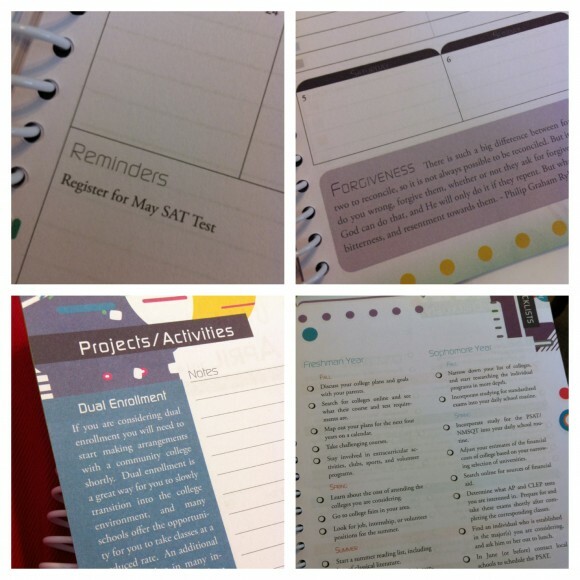 The 4 Year planner helps me – as the teacher/parent – to remember it all. Not only remember what we might need to be doing during a freshman or sophomore year but to write down and remember the good, the challenges, the tips learned from other homeschooling parents. Plenty of room for a well-mapped four year high school plan with space for credits, subjects and course descriptions. Yes, I have a 4 year high school planner for each of my children, 9th and 10th graders. Because they each have their own skills, pursuits, studies, personalities and goals. We are surely used to sharing resources in our homeschool but I feel it is important to have an individual plan for each of my children based on their gifts, talents, skills and what the Lord is calling my sons and daughters to do. The High School 1 Year planner is the planner my freshman and sophomore pull out to record their weekly assignments during our family planning meeting. This planner is where they write down the page numbers, the papers due, the social activities, the extracurricular. It’s small enough to carry around the house or tuck in a backpack to take to civics class. Both my high schoolers’ planners are housed in our magazine rack right above the family room couch. Most of their reading is done from the comfort of this couch, so it makes sense to have the planners right there. One for each of them! (Notice the 4 Year planners are tucked right there as well). Builds independence. The gift of planning and time management. Detailed notes on assignments, due dates, requirements. Central location for weekly, daily expectations. Are all these planners just way too much? Maybe so but like I shared in my family planner review, I am a spiral notebook lover. And all my plans and records, all my children’s plans and records are in one spot – within reach. 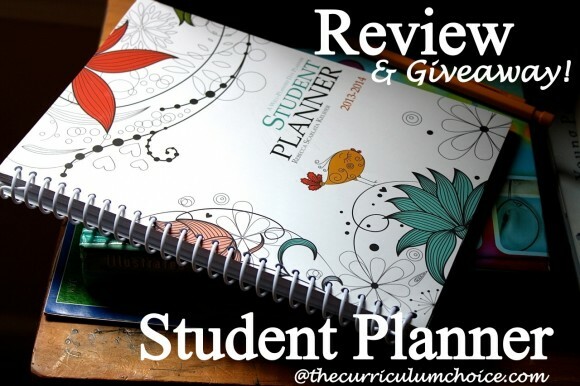 Student Planner – with a giveaway today at The Curriculum Choice! I received a copy of the Well Planned Day 4 year High School Planner and two high school planners in exchange for my honest review. All opinions are my own with many contributions from my high school son and daughter. I was not compensated for my time. Please see our disclosure policy. Thanks! I’ve been wondering about this planner. Looks like I will be buying a couple of these in the next 2 years. We have used these planners before and loved them. They have so much more to offer than other planners. So many more resources are included besides forms and calendars. Thanks for the chance to win one! Great post, Tricia! It is so important to be organized about this, and this looks like a helpful resource. I am honored and grateful that you considered my post worth mentioning. Thanks, Tricia! Annie Kate! Thanks so much for sharing that post as well. You are a great encouragement to me and my family! And I completely agree that in planning we should consider all of life not just a career. As we begin my daughter’s freshman year, these planners look like they’d be ever-so-helpful!! We have been using an organizer on the computer. Just yesterday I was talking with my oldest about how we would be working in making his high school plan this year. So frightening and exciting all at the same time! These planners sure would come in handy! My daughter started high school this year. I have been letting her be more involved in the planning process this year. She picks the books she will be reading (on topic.) She also keeps track of her school hours. She also gets to choose from a list of activities which ones she completes every week. It has been fun to see her becoming more involved in choosing what her week looks like. She is enjoying it too! I hadn’t thought about a 4-yr planner before. I can definately see the benefits. I went to hear several speakers talk about what to do over the high school years regarding tests and so on. A 4-year planner would be the perfect place to write it all down and not forget what’s coming up! We don’t start high school for another year but I would love to have this already on hand before that time. I use planners and I love them they make it easy to begin my day. 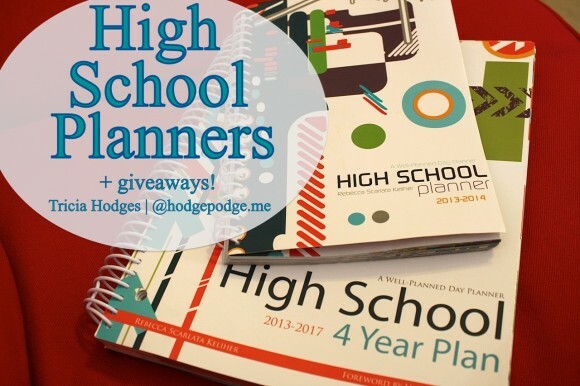 My best planning tip is … involve your high schooler in the planning process. Let him or her help with the process, choosing of curiculum, etc. Hello! Please do not submit me into the giveaway. I just want to say God Bless You for sharing what you use in your homeschool. I currently do not have children. YET! But I am already planning for homeschool as I prepare for God giving me a baby. Preemptive strike you can say. I have been working on my own planner so I always love hearing what makes a good planner. Have a wonderful, blessed day!! These planners look awesome! I’ve been looking at them for a while, but hesitant to yet purchase. After seeing what everyone else is saying I might just have to! I love the 4 year planner, it would save so much time and effort! I tend to be a bit scatter-brained and disorganized. To prevent my life from spiraling out of control, I am a planning FrEaK! I’m trying to get my son into the same habits: writing everything down, keeping a schedule, checking and double checking, etc. i used personal calendar/agenda to jot down all of our activities … try to keep them color coordinate too (1 color per name) that way i won’t get confused. love to win this. thanks for the chance. I ask my children what their interests are for “free” time as well as what they want to study as electives. Then we work together to see how things work best for them and me. Wow! Would I love to try this. I’ve been drooling over it for years. Thanks for sharing! Clearly, I should read diredtions…I created laminated charts with daily tasks (very generic, i.e. math, nature study, etc.). They cross off what they’ve finished as it hangs on the wall, and I can see very quickly what they’ve accomplished and what they need to tackle yet. I also have a chart for myself. I need 3 of these right now as I have 3 in high school and 2 babies,3 and 4. This will be a great resource and tracker for them as now I am having them keep track of everything they do. We have not ever had a weekly HS meeting as a family. Mom has always done the planning. I am encouraged to start a weekly meeting this year following your lead. Winning one of the planners would surely help me accomplish this! My oldest starts highschool next year. I am trying to plan ahead by reading everything I can about homeschooling highschool. The more I read and plan the less intimidated I get. I have three schooling now and a six month old, planning is essential! I’ve got my first highschooler this year. Kind of crazy. I’m not sure what all to do with it! I could use a planner like this. Thanks! This is would be great for my three highschoolers this year! Thank you for sharing.